Warren Gatland has ruled himself out of contention to coach the British and Irish Lions in 2021. Gatland also revealed he “hated the press and negativity” in New Zealand surrounding the Lions’ 10-match tour, which was highlighted by a drawn Test series against the world champion All Blacks earlier this year. At one stage of the punishing six-week trip, the New Zealand Herald newspaper published a cartoon depicting Gatland as a clown, complete with red nose. After serving as Lions head coach in Australia four years ago, winning the Test series 2-1, then holding New Zealand across three memorable games, New Zealander Gatland would be viewed in most quarters as a clear favourite to lead the 2021 South Africa tour. But speaking to reporters on Monday, Wales boss Gatland said: “I’m done. I hated the tour. I did. I just hated the press and the negativity in New Zealand. Asked about potentially throwing his hat into the ring for South Africa, Gatland added: “I wouldn’t subject myself to that. Gatland’s Lions recovered from losing the opening Test to topple the All Blacks a week later in Wellington, before the Eden Park decider ended 15-15. It was the Lions’ second-most successful New Zealand mission in history. “I think when you reflect back on it, it was some achievement. When you think of the quality of the opposition,” he added. “Previous tours, you could go on a Lions tour and have a midweek game where you know you can back off a little bit and make some changes and the guys can still comfortably win the game. And that allows you to recover a little bit. “But the quality on this tour was relentless. You had to make sure you did the best you could and preparing for the quality of opposition. 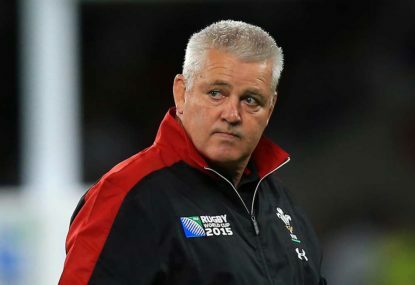 Gatland confirmed he had submitted his post-tour report to Lions chiefs. “I think the last six or seven reports from (lions) coaches have been exactly the same. They have been about preparation. “South Africa is a little different because of the time zone – you can probably handle a little less preparation time – but Australia and New Zealand are different again.